I have seen this shoe at the Dublin Marathon Expo at the end of October but it was much too expensive to buy. It officially came out two three ago but didn’t get a chance to get it and run with it until yesterday. I went over to Marathon Sports on Boylston street and bought it. After the Boston Marathon this year, I will be buying all the newest shoes from Marathon Sports. I called yesterday afternoon to reserve a pair as they only had a pair in each size. I picked it up later in the afternoon and ran after I got home. I started with Wave Rider 14 which was universally disliked because of the high ankle support and mid foot support. However, as this was my first running shoe, I got used to it. I did have callous on my back heel from the high ankle support but that went away during the subsequent training after my first marathon. The WR15 fixed all of the issues and brought it back to what the WR13 was from what I read. It was a better shoe than the WR14. I tried it out in the store and the shoe was very stiff. It could be because it was a brand new shoe and also the extreme cold weather outside. I am not sure if their warehouse was heated or how long it spent in the cold but it took about 10 minutes of walking in it for it to soften up a bit. I walked about a mile and a half home on it and it broke in nicely before my run. I’ve seen this shoe before online and in person in Dublin. It is a very sharp looking shoe. The molded uppers creates a very clean minimalist look. You can definitely feel the difference too (see next section). After dressing up for the 20F weather outside (wind child at 11F), I went off with the new shoe. The uppers felt much thinner and if you wear thin running socks, you can really feel the difference. Even though the uppers felt thinner, it wasn’t more porous either. I would know as my feet was pretty warm even though it was freezing outside. The uppers didn’t feel nearly as substantial as the WR16 by comparison. On my 8 mile run, I had a hard time noticing the loss of weight. It may take a few more runs with both shoes for me to tell. I am not sure at what point I felt the weight difference between the WR15 and WR16, but it is definitely noticeable. The weight difference between the WR15 and WR16 is similar to the WR16 and WR17. The cushioning under the heel feels very similar to the previous version of the shoe. 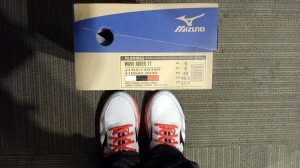 I read that Mizuno tried very hard to create the same feel despite the reduction in weight. 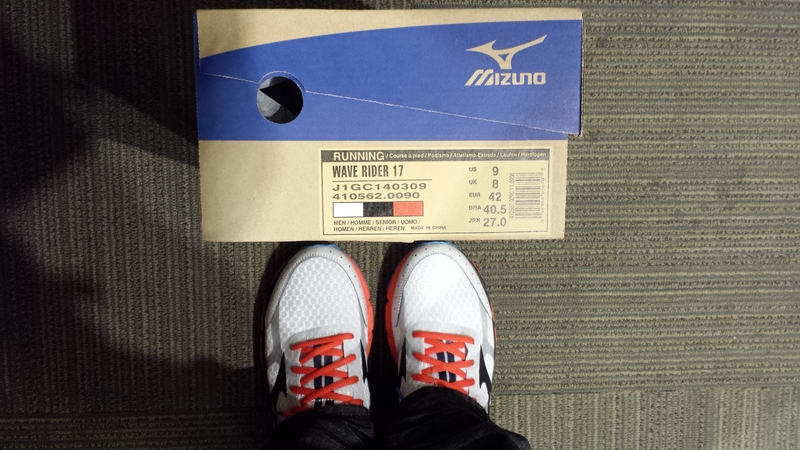 It worked very well and I can’t tell the difference in cushioning between the WR16 and WR17. 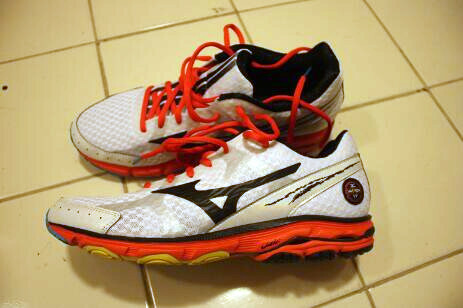 Be the first to comment on "First Run with the new Mizuno Wave Rider 17"